"Please meet the nurse in Room 1"
"Please return to the registration desk for your paperwork"
"The technician is ready - Please report to the testing lab on the 5th floor"
"The doctor is ready to meet with the family at the reception area"
Simple to use for staff - One click does it all! Fully Compliant with your organization's policy, HIPAA, and TCPA. QuickPage is an affordable way for your organization to keep patients, staff, and family members in the loop by quickly sending safe, compliant text messages. 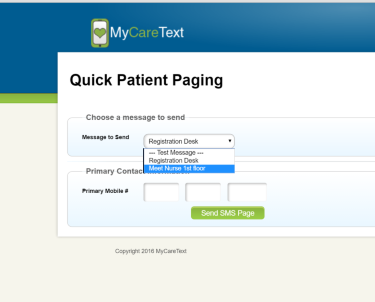 It is also an excellent introduction to the MyCareText suite of applications for supporting your patient experience efforts.Click the button below to learn more and qualify for a Free Trial of QuickPage!